With three or more people, it is easy to set a toprope on the first pitch, then have a novice leader and belayer ?lead? the first pitch, backed up with the toprope. If you do this, be sure to set a two-piece equalized directional before the traverse to the bolts. A belay can be set in the thin crack 10' right of the bolts (start of Pitch 2 of Lazy Bum) if crowds occupy the bolts. 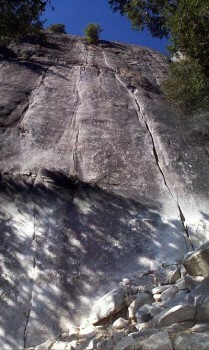 Linking the two pitches is not recommended due to the 20' traverse on the ledge. Which SuperTopo guidebooks include a topo for Jamcrack?